How to purchase a plan on Convertize? To be able to purchase a plan on Convertize, you first need to create an account. 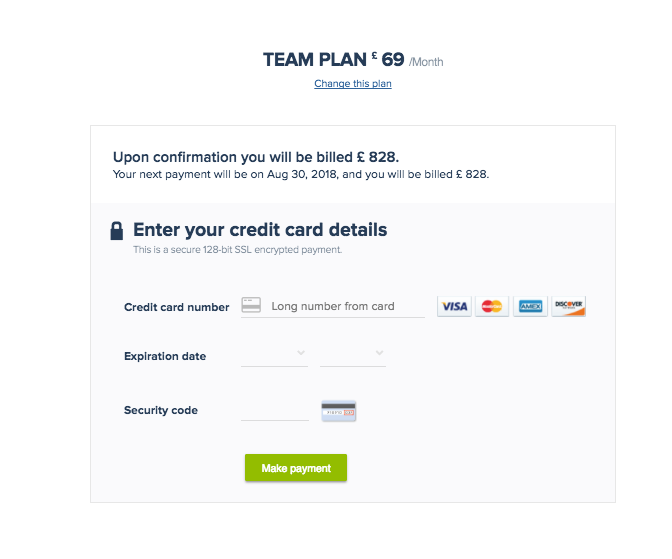 Then, from your dashboard, you can access the plan page by clicking on “Upgrade plan” and choose between Starter, Team or Enterprise. Simply select one and add your Debit/Credit card details. You can use any of the payment types listed below. How do I renew a plan? Whatever your plan type, it will be automatically renewed monthly or annually (depending on which one you chose when signing up) until you give us notice that you want to cancel you plan. To cancel your subscription, please send us an email at invoice@convertize.com or contact us using the chat (blue button on the bottom right of your screen). How do I cancel a plan ? To cancel your subscription, please send us an email at invoice@convertize.com or contact us using the chat (blue button on the bottom right of your screen). We do not provide refunds on already paid months. You can change your password by clicking on your account profile at the top right of the dashboard and clicking on “Profile”. Please note users who log in with their Google Account cannot access the Profile view. If you want to change the name or email details of your account, contact us via the chat option (blue button on the bottom right of your screen) and give us details of the change you want to make. You may cancel your subscription at any time but we cannot refund any amounts that you have already paid. If you want to cancel your subscription, email invoice@convertize.com or use the chat (blue button on the bottom right of your screen) on the platform to contact us. After you have requested this once, your invoices will be emailed to you monthly. If you want to change your billing details after having purchased a plan, please either email invoice@convertize.com or contact us by using the chat (blue button on the bottom right of your screen). All UK-based companies are subject to VAT (20%), which is included in the price of each plan. For non-UK companies, the price of the plan does not include VAT.